Quality, community and security combine to make this exquisite European-inspired home a must-see contender if you are shopping for a new Brentwood home. Located in Glen Ellen at 9516 Wicklow Drive, you’ll find four large bedrooms (including an enormous master suite and additional guest suite on the first floor), three and a half baths and plenty of room for entertaining family and friends. Unexpected amenities include a built-in storm shelter that also provides climate-controlled storage and a wine closet with exceptional rack as well as refrigerated storage space. The grand entry makes an equally grand impression with matching arched entries to the formal living and dining rooms on either side. The wide hardwood staircase with decorative iron spindles enhances the space. At the center of the home, the bright and stunning kitchen serves as its hub. With granite countertops, stainless appliances including built-in double ovens, plenty of natural and task lighting, and abundant storage, everything else seems to flow from here. A butler’s pantry provides additional storage, glass-front cabinets for display and granite countertops that provide ample room for bar or buffet service. The space connects the kitchen with the large formal dining room which easily accommodates a table for eight or more. Opposite the dining room, is a mirror-image living room that can also be utilized as a study or home office. The kitchen also opens to the inviting family gathering room accented with a custom coffered ceiling, recessed lighting and ceiling fan for comfort. A fireplace serves as a focal point. The adjacent informal breakfast area looks out at the landscaped back yard that adjoins the lake. Arched entries, beautiful hardwood floors, neutral colors, crown moldings and other custom details pull the home’s interior together into one seamless, beautiful arrangement. The 19-by-16 square foot master bedroom features a wall of windows fashionably covered with custom plantation shutters, recessed lighting and a ceiling fan for comfort. The master bath has his-and-her vanities and walk-in closets. A second main-floor bedroom with private bath provides a perfect guest or in-law suite. Upstairs, in addition to two large bedrooms, a spacious bonus room has plantation shutters and surround sound. Adjacent to the bonus room, the current owners have finished out a storage room that can serve as a library, home office or yoga room. The possibilities are endless. Families will appreciate the three-car garage that features an epoxy floor. Outside, the beautifully landscaped .42-acre lot is the perfect size. A large pergola covers the back patio that’s surrounded by cedar trees which provide not only beauty but privacy. 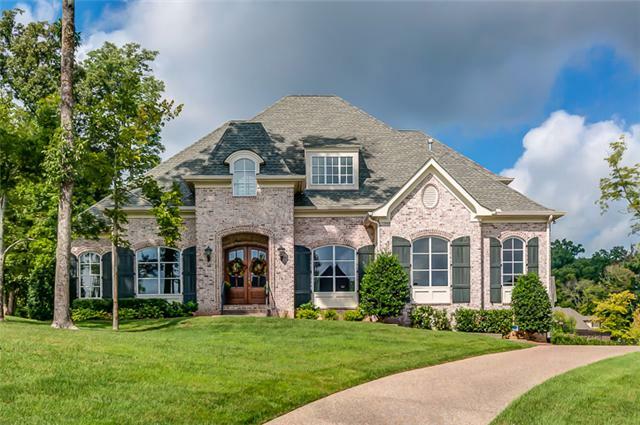 Zoned for Williamson County’s award-winning Kenrose Elementary, Woodland Middle and Ravenwood High schools, this home is listed at $765,000. For more information or to arrange a showing, contact listing agent Marla Richardson of Realty Trust Residential at 615-376-4500.